As it is known, the Far East development has been recently paid special attention since this region neighbors promising markets of the Asia-Pacific Region. At the same time, it is poorly populated and requires considerable investments in creation and modernization of infrastructure. The Free Port of Vladivostok was established to encourage the development and investments. A lot of stevedoring projects have been recently announced in the region. They are primarily related to coal transshipment. Yet, few of them have come to practical implementation. Among them is the project on development of AO Vostochny Port’s Phase 3. When the facilities of Phase 3 are put into operation, throughput of Vostochny Port will reach 39-40 million tonnes in 2019. As of today, it is the largest and most sophisticated coal terminal in Russia. Its development was quite intense before the Law on the Free Port came into effect. 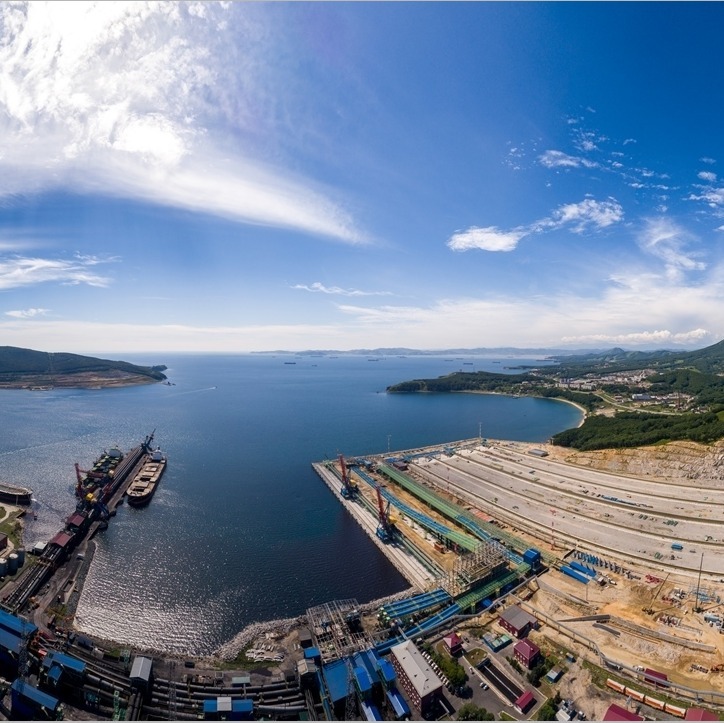 As Irina Olkhovskaya, First Deputy to General Director of OOO Port Management Company running AO Vostochny Port, the project development intensified when the company was granted the status of Free Port of Vladivostok resident. That status provides the resident with a package of state services on a fast-track basis. The advantages of FPV residents are also available for other investors in the region. When speaking about the projects planned for implementation we should mention the agreement signed by AO Far East Development Corporation and OOO Sea Port “Sukhodol” (fully owned by Holding Company “SDS”) in May. The agreement provides for investment activities covering the construction of a dedicated port to ensure access of small-size and mid-size coal producers to port infrastructure. The FPV resident will invest over RUB 30 billion and created some 660 jobs. The first two turns of the coal port will let handle 12 million tonnes of coal per year. The construction will be completed in 2021. The third turn will be completed in 2022. That will let increase annual coal transshipment by 6 million tonnes. In May, SDS also signed an investment agreement with Russian Railways to cooperate under this project. In July, the company signed an agreement on providing services to link the non-public railway lines of OOO Sea Port “Sukhodol” to the infrastructure of Russian Railways. The Free Port regime is also in force in the Vnino and Sovetskaya Gavan districts of the Khabarovsk Territory. According to Vyacheslav Shprot, the Territory Governor, a number of projects on construction of new coal terminals have been announced here but the capacity of railways is not sufficient. Taking into consideration the announced plans, transportation of railway cargo in the region will total 29 million tonnes in 2018, 35 million tonnes in 2020 and over 100 million tonnes by 2025. That will necessitate the construction of a new railway line between Komsomolsk-on-Amur and Vanino, a bridge across the Amur river and other facilities. VaninoTransUgol (VTU, a subsidiary of Coal Mining Company “Kolmar”) is going to complete the construction of a dedicated coal terminal in the Muchke Bay (Vanino District of the Khabarovsk Territory) in Quarter III of 2019. 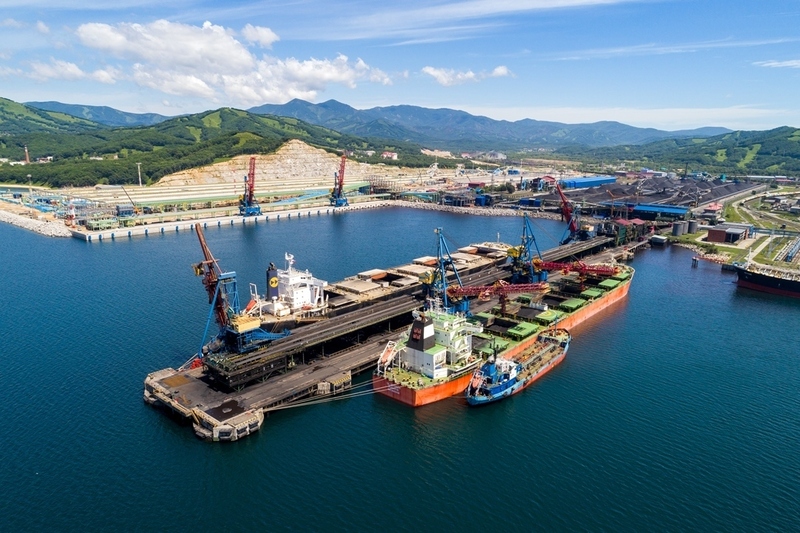 According to Kolmar General Director Sergey Tsivilev, the company currently using sea terminals of the Primorsky Territory will transport coal via its own terminal in Vanino from late 2019. “It is much closer – 2,200 km. Therefore, it will be cheaper. The distance to the Primorsky Territory is 2,500 km. We have selected that site for the terminal to ensure efficiency in terms of logistics”, comments Sergey Tsivilev. VTU began building the coal terminal in June 2017. The project is being implemented through FPV regime. As it was announced earlier, the new terminal is intended for transshipment of coke-coal mined in Yakitia. Competitive advantages of the terminal is the depth of its water area and at the berths as well as short distance to coal reserves of Yakutia. State-of-the-art transshipment equipment able to handle 6,000 tonnes per hour will ensure closed transshipment of coal. The project estimated at RUB 35 billion have two phases. The first one will be completed in QIII’19 ant will let transship 12 million tonnes of coal per year. With the completion of the second phase the terminal’s capacity will be increased to 24 million tonnes by 2023. In June 2018, Far Eastern Grain Terminal (DVZT, fully owned by United Grain Company) submitted an application to the Far East Development Corporation for signing an agreement on investment activities in the territory of FPV. OOO DVZT is going to build a dedicated grain terminal in Zarubino seaport. The facilities of the first phase that can be built in the Troitsa Bay (Primorsky Territory) are to handle 3 million tonnes of grain per year with a possibility to be expanded for annual transshipment of 10 million tonnes. According to Ministry for the Development of the Russian Far East, the potential investor believes that a dedicated grain terminal in the Far East will let Russian companies enter the markets of the Asia-Pacific Region and shift cargo flows to Zaubino seaport allowing to reduce logistic expenses and transportation time. However, implementation of this project is up in the air because of the arrest of Magomedov brothers, co-owners of Summa Group. One of them owns 49% of UGC. When visiting China in June 2018, Acting Governor of Primorye Andrey Tarasenko held negotiations with Ma Li, Vice President of China Railway Group Ltd. Andrey Tarasenko proposed the partners consider three large infrastructure projects in the Primorsky Territory. One of them relates to construction of Zarubino port and a railway access to it. This transportation hub is a part of the Primorye-2 transport corridor providing the Jilin province with an access to sea. The interest to the project has been expressed by the association comprising the largest ports of China. Russian President Vladimir Putin and President of the People's Republic of China Xi Jinping earlier held negotiations which resulted in signing a number of agreements on joint implementation of infrastructure projects including freight/passenger road “Eurasia”, transport corridors “Primorye-1” and “Primorye-2” as well as joint development of the NSR, Transsib and BAM potential. The Far East Basin is a sort of eastern gate to the Northern Sea Route which has been under intense development in recent years. NOVATEK that launched the Yamal LNG project has announced its plans on building an LNG reloading complex in Petropavlovsk-Kamchatsky with capacity of 20 million tonnes. The facility due to be ready by 2023 would transship LNG from Arctic tankers to the conventional ones. That would let decrease the expenses for LNG transportation from the Arctic but a considerable part of the route will anyway run along the NSR featuring a seasonality and entailing icebreaker support expenses. The terminal, which is to be built in Bechevinskaya Bay (previously used by RF Navy) is supposed to operated for more than 40 years. The development of the transport system in the Far East Region is not possible without fleet modernization. In 2017, RF President Vladimir Putin approved a list of instructions following the State Council Presidium meeting on the comprehensive socioeconomic development of the Russian Far East RF Government was instructed to ensure, starting from 2018, the construction of a freight-passenger ships to ensure links with the remote areas (Sakhalin, Kurils, Kamchatka). This issue was brought up again at the State Council meeting held on 10 September 2018. It was announced that construction of two ferries for the Kamchatka Territory would be financed by the federal budget. The construction of the first ship is to begin in 2019, the second one – in 2020. 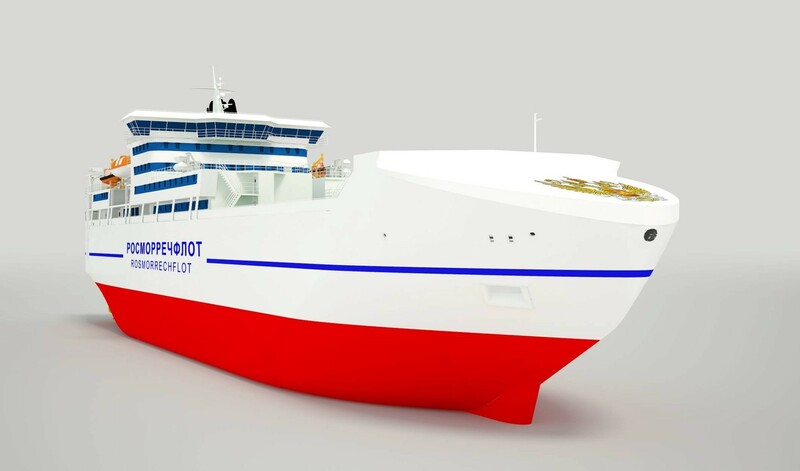 In 2016, joint work of Kamchatka Territory Government and the Directorate of the State Customer of Rosmorrechflot resulted in creation of a concept design of a ferry, CNF22, capable of carrying 150 passengers and up 70 vehicles. The ferry’s cargo deck can accommodate up to 40 twenty-foot containers (20 passenger cars) with loading/unloading involving no port facilities. As for the links with Sakhalin, State Transport Leasing Company will partially finance the construction of two ferries. Budget allocations for construction of two freight/passenger ferries under this programme total RUB 5.5 billion. The ships designed by Marine Engineering Bureau-Design-SPb are to be built by Amursky shipyard and to be delivered to the customer within three years. Three cargo decks of the ice-class ferry can accommodate 30 railcars, 48 tractor-trailor units and 28 passenger cars. Passenger capacity of each ferry - 150 passengers. The ships can move in 1-meter thick ice at a speed of 3 knots and can be operated in stormy weather. A voyage on Vanino-Kholmsk-Vanino route takes them 24 hours. In August 2018, Nevsky Shipyard (Nevsky Shipbuilding and Ship Repair Yard) signed a contract with AO Sakhalinlizingflot for construction of two ice class freight/passenger ferries of Project PV22 to be deployed on the Sakhalin-Kuril Islands route. The ships designed by Marine Engineering Bureau-Design-SPb are to carry up to 146 passengers, general cargo, including refrigerated and packaged dangerous cargo. The ship features a larger hold (895 cbm vs 208-215 cbm on ferries of previous projects. Ferries of Project PV22 can carry 24 containers (including 8 refrigerated containers) and 6 passenger cars. An extensive shipbuilding programme has been developed for the fishing fleet of the Far East Basin. The Eastern Economic Forum is supposed to address all issues related to the development of water transport infrastructure in the Far East of Russia. The programme includes a “Business breakfast” with representatives of Korean businesses particularly interested to cooperate in shipbuilding. A special session will be dedicated to Arctic issues as well as to development of port infrastructure. Yury Tsvetkov, Deputy Minister of Transport of the Russian Federation, and Irina Olkhovskaya, First Deputy General Director of Port Management Company will be among the participants of the port infrastructure session.